Kim's Kitchen Sink: Santé Nuts! At this year's Food Fete, I stopped at the Santé Nuts table for...quite a while. These are some delicious nuts, you guys. And I feel great supporting them -- Santé is the brainchild of a single mom whose kids suggested she sell the delicious spiced nuts she often made for them at home. They're roasted in organic canola oil, made locally in Santa Clara in a peanut-free environment, and are all natural, gluten-free, and vegan. And they're delicious. 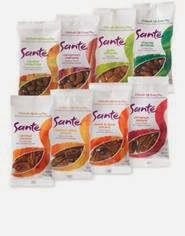 Santé sent me a sample pack of their snack-size bags, and Will has been eating them so quickly that I'm having to fight for my own! Susan Burdick is way nicer. To celebrate National Almond Day (which was yesterday, when I was originally going to post this), Santé is giving away 2 full-size bags of their Chipotle Almonds and Garlic Almonds. There are lots of ways to enter, so check out the Rafflecopter below! They're also offering 20% off their almonds Sunday 2/16 – Saturday 2/22. Head to their online shop and use promo code ALMOND214 to get the discount on super tasty sweet or savory nuts! That's a hard choice I'd say Almonds but Pecans come in a close second. Really it depends on why I'm eating them. Whooo! Free nuts! I need more delicious snacks that are not chocolate! Congratulations to Rafflecopter-selected winner, my mom! Hey! I found out after choosing a winner that immediate family members are ineligible to win -- I chose another winner via Rafflecopter, and you're it! Expect some nuts coming your way soon!